From a microbiological perspective, there are two main sources of contamination in pools and spas. Bather derived microbes washed from the skin or present in body fluids discharged into the water. 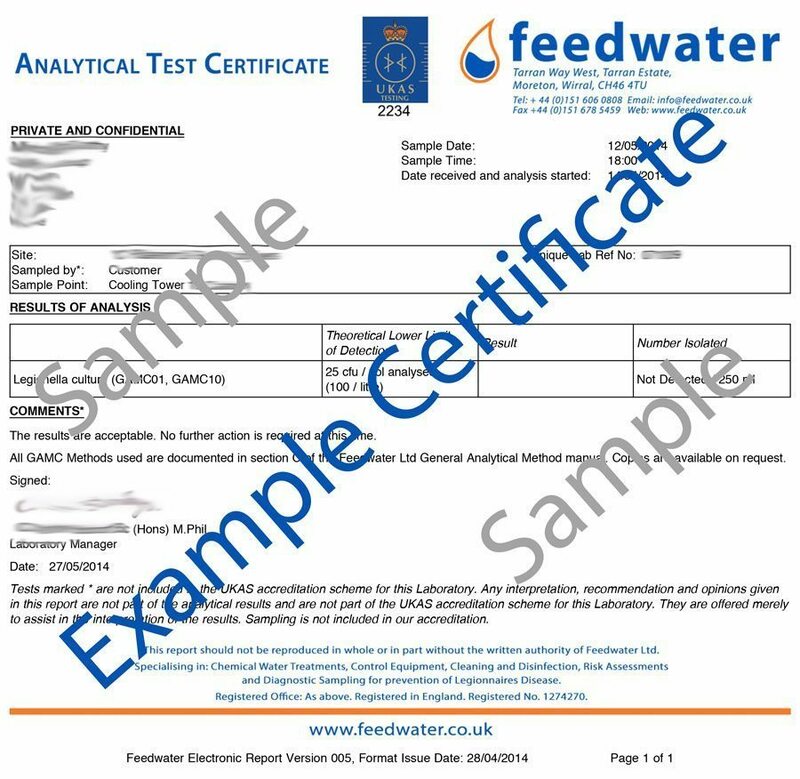 The appropriate guidance document for analysis on pools is published by The Pool Water Treatment Advisory Group (PWTAG). It is likely the microbial challenge in colder swimming pools will be much lower than for a spa pool. Swimming pools and plunge pools normally have a lower microbial population than spa pools. However, both types of pool require microbiological monitoring to ensure they remain fit for continued use. How often should you perform Swimming Pool testing? Private pools are sampled at the discretion of the owners but we strongly recommend the same sampling frequency. This analysis omits Legionella as it is not required for Swimming Pools and is only needed quarterly in Spas. 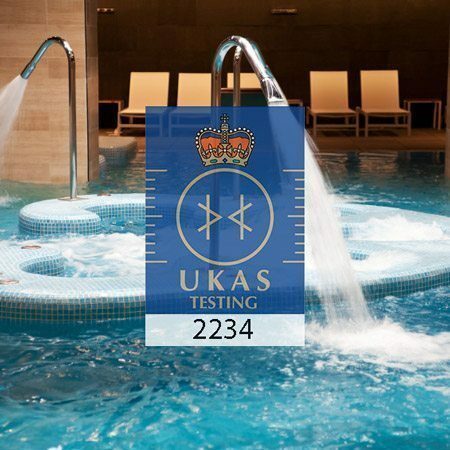 For obvious reasons, the likelihood of microbial issues in a Spa is much higher as the pools are at higher temperatures and are frequented much more often by bathers. This, in essence, creates an incubator for microbes to grow. The analysis for warm water pools differs from cold pools in that it is recommended to test for Legionella also. 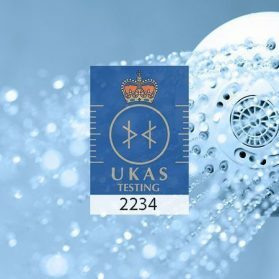 This test should substitute the Hygiene only analysis every 3 months so you can keep a log of Legionella. *TVC/Aerobic colony count is a basic measure of microbial loading in the water and very tight limits are set for this parameter. 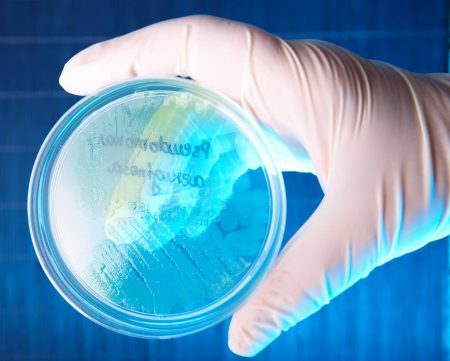 157 The monitoring programme should include the routine monthly sampling and testing for the presence of bacteria and should include an ACC (or total viable or total colony count), coliforms, E coli, and P aeruginosa, in addition to quarterly tests for legionella. 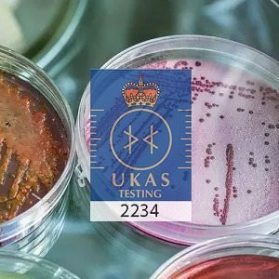 158 The ACC will give an indication of the overall microbiological quality of the spa pool and whether microbiological control is being achieved. This should be carried out in accordance with BS EN ISO 622228 with incubation at 37 °C for 24 hours. 159 The presence of E coli and/or coliforms is an indication of the presence of serious contamination and a failure in the water treatment system to remove the contamination. 160 The presence of P aeruginosa is an indication of water treatment failure with likely colonisation of and biofilm formation on the spa-pool filter and within other parts of the system. We include a pre-paid Special Delivery mailbag with your packet, you must be able to get to a post office same day as sampling. If you know this isn’t possible, speak to us about our courier collection option (this is at extra charge). 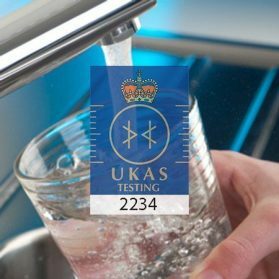 You will receive a sample pack in the post to take your water sample, you will then be able to return your sample with our prepaid postage label. 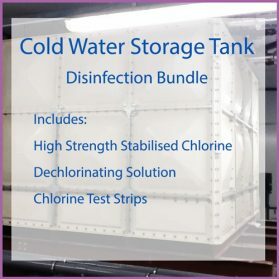 The analysis takes from a couple of days for the Pseudomonas results and at least 10 days to confirm a negative Legionella result, a positive result will be reported as soon as observed. 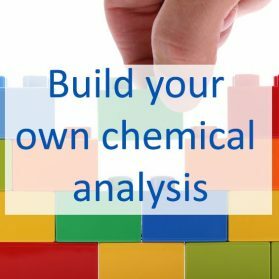 Simple test kits for commonly used biocides are available. Chemical products used in Spa Pool treatment. 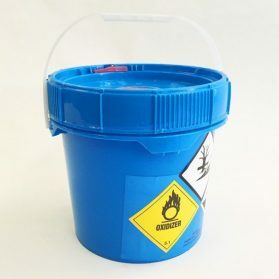 I ordered over the internet and a sample jar arrived in post, with simple paperwork, once we had sampled the water, we simply returned and received our result with certification via email. All in All, the ideal solution for microbial water testing. 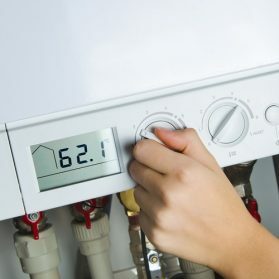 We will definitely use this service again. I have just started a Canine Hydrotherapy business near Carmarthen; West Wales Canine Hydrotherapy, and it is a requirement that the pool water is tested regularly for bacteria. 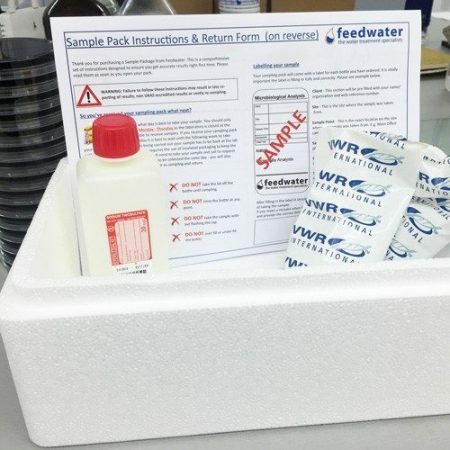 Feedwater has a quick and simple solution. 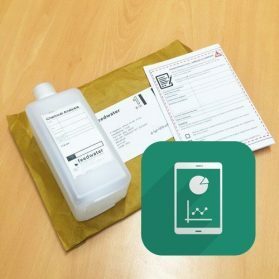 Order online, and the kit arrives, with clear instructions for testing and returning, and all packaged really well. 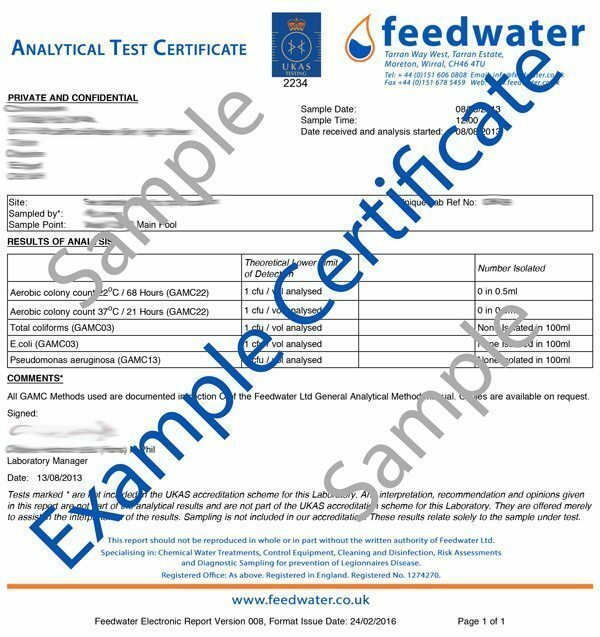 A few days later, the results come through by email – fantastic, just what I need with minimum fuss, thank you Feedwater, I’ll definitely be using your services again. Once again, speedy delivery, easy to use sampling kit, clear instruction guide and fast results via e-mail…\r\nAll in All, the ideal solution for microbial water testing.\r\nWe have used Feedwater Swimming Pool \/ Spa Microbial Water Analysis kit several times over the last year and always got a perfect and fast service. 100% satisfied!